The master-planned community of Bridgeland on the north-west side of Houston is peacefully situated among lakes, rivers and trails. That natural beauty informed the creation the wetland-themed play space of Dragonfly Park at the development’s amenities center, designed collaboratively by Clark Condon and Earthscape. 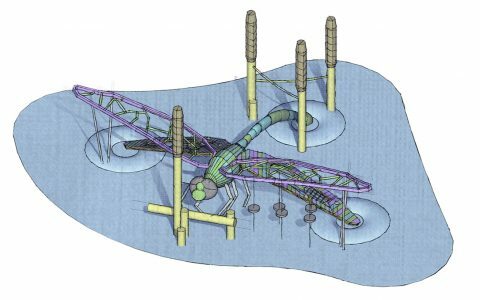 The completely custom and unique central feature of the playground is an enormous dragonfly sculpture that stretches 10.5 metres (34 feet) across its wing span. 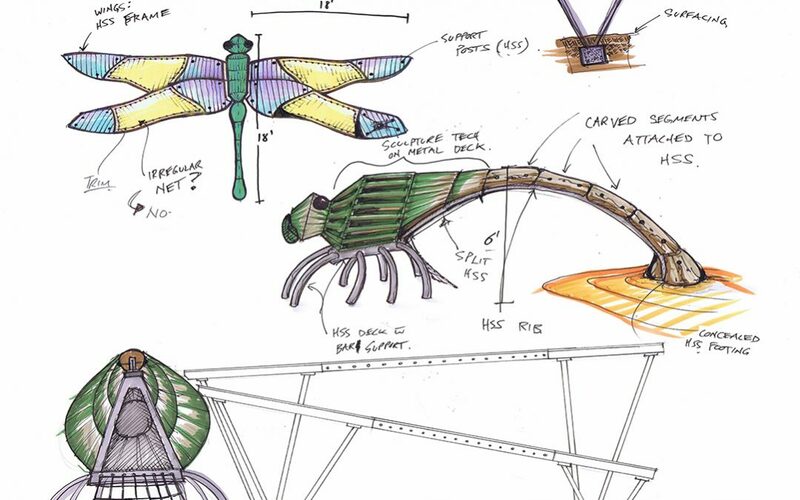 The dragonfly’s body is a combination of chainsaw carved oak and sculptural form and cladding. The four wings each offer different play and climbing opportunities. The dragonfly sits among additional playable elements that reflect the ecosystem of a dragonfly, including tall grasses and plants.